In the late 1940s’ out of Butler University came a group called the Four Freshmen. The group is still going today of course none of the members are from that beginning group. At the time of this picture the last living member from the beginning group is the one that my cousin (Tom) and I are standing between. Bob Flanigan. Each year the group has a three day reunion in some city in the U.S. My cousin and I have attended a number of these gatherings. 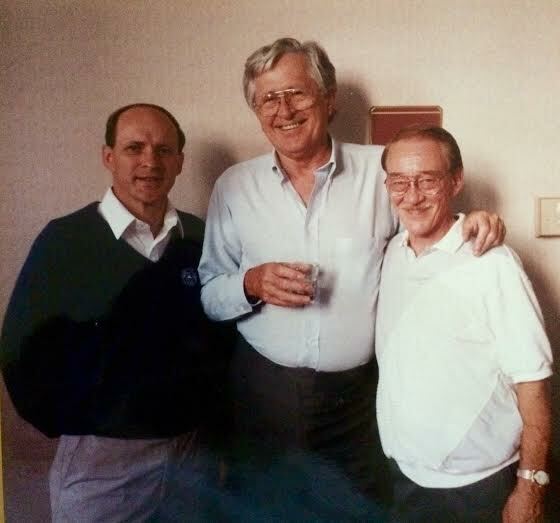 In fact this picture was taken a few years back at one such reunion in Columbus, Ohio. You may remember the group from the song It’s A Blue World or Graduation Day. The group has great vocal harmony and many later day groups such as the Beach Boys often tried to pattern themselves after the Four Freshmen. Recently they appeared here in Franklin,TN where I live today. Great music…from a great time period.